Media > Reasonable Faith Podcast > Is There a Good Analogy for the Trinity? Is There a Good Analogy for the Trinity? Dr. Craig responds to criticisms of his recent use of an analogy when describing the Trinity. How are we to handle various attempts at illustrations and analogies of this crucial doctrine? Transcript Is There a Good Analogy for the Trinity? Kevin Harris: Dr. Craig, from time to time we not only respond to questions that people send us but we respond to various criticisms that we might encounter on the web or that we receive in various ways. And people are pretty quick to send these and say, “How do you respond to these?” Some we may not be aware of, but quite often when it's someone who is well-known we'll get word of it quickly, and we'll try to respond. What I'm referring to is an analogy that you gave of the Trinity that came under attack from our friend Dr. James White. What was that analogy that you gave in Florida, and what were his concerns? Dr. Craig: This is in reference to a Veritas Forum at the University of Central Florida where a student asked me, “Can you think of any analogy of the Trinity?” And I said, “Well, yes, in fact I can.” And I began to lay out something that I had used in the book Philosophical Foundations for a Christian Worldview in the chapter on the Trinity. Now in the book Philosophical Foundations I was more careful than I was, unfortunately, in the spontaneous Q&A because I did not present this as an analogy to the Trinity. I think Dr. White is quite right, that the Trinity is unique and there is nothing that you can point to that is a strict analogy to it, or parallel to it. And that's why I don't like analogies, I don't like to use analogies like the triple point of water, or water being steam and ice and liquid, these sorts of things. I just see no reason to think that there should be anything truly analogous to the Trinity. Rather in Philosophical Foundations for a Christian Worldview what I am doing is trying to make sense out of the doctrine of the Trinity that the notion that there are three persons who are not three beings, but are one being. And what I look at is this illustration of Cerberus, which was this three-headed dog guarding the gates of Hades in Greek mythology, and I press this and adapt it and adjust it in certain ways to try to see if we can make sense of the idea of three persons which are nevertheless one being rather than three beings. And in the end I reject the analogy of Cerberus. I say it doesn't go far enough because even if we adjust the Cerberus story so that we now have not three canine minds, which are one dog, but we invest them with self-consciousness so that we actually have three persons which are one dog, which seems now getting very much closer to the idea of the Trinity, still, the difficulty is when Cerberus dies, when his body dies, it would seem that you have three separate persons – three souls or whatever, three minds – that wouldn't be one being. So ultimately Cerberus, though it gets you some direction toward the Trinity, it ultimately falls short. And so what I finally propose is that we need to think of God as a soul, an unembodied mind, endowed with three sets of rational faculties each of which is sufficient for personhood. And that will get you a doctrine of three persons in one being. Now in the Florida Veritas Forum I think I spoke too quickly in saying this is an analogy of the Trinity. Certainly there are analogous elements in the Cerberus story, but it's not a complete and finally satisfactory analogy for the Trinity, as I explain in Philosophical Foundations. The good thing about the illustration, though, is it does help to get us thinking about how can you have a tri-personal being? That's the question that unitarians and other skeptics of the Trinity would pose for us trinitarians. What sense can you make of a tri-personal being? And I think the Cerberus story can help us to make some advance in understanding that if we invest these three canine minds with self-consciousness and hence personhood. And then we do see here we seem to have a tri-personal dog, a tri-personal entity. The reason I feel uncomfortable with the Cerberus story is not because it isn't helpful in understanding the question of how you can have a tri-personal entity. But rather because people who are unsympathetic to the doctrine of the Trinity, who are just looking for something to criticize or to mock, will find it disrespectful and unhelpful to compare God to a dog. And that is obviously something that makes one very uncomfortable. The Muslim detractor of the Trinity is apt to be very offended at the comparison of God to a dog, even a mythological dog, and I understand those religious sensibilities. But what I would ask the genuine seeker after truth, here, to look at is to say that we're not providing an analogy to the Trinity, we're not providing an analogy to God. What we're trying to do here is to understand how you can have a tri-personal entity. How can you have an entity which is one being, one entity, and yet is three persons? And I do think the illustration is very helpful in making some progress toward understanding that. Kevin Harris: Am I to understand, Dr. Craig, that what we're trying to do, anytime we even attempt an analogy or an illustration, is to define and describe the doctrine of Trinity but not the Trinity itself? Dr. Craig: I don't seen any differentiation between the doctrine of the Trinity and the Trinity itself. I mean, obviously God isn't a doctrine. A doctrine is a propositional entity; God is a concrete object, so obviously the Trinity isn't identical to a doctrine. But when you provide an illustration or an analogy, if you've captured the doctrine of the Trinity correctly then it would be to posit some entity that would be analogous to God in his tri-personal being. So the way I see it is that these analogies can help us make progress toward comprehending or understanding the Trinity so that it's not just a mystery or a logical paradox. We can make some sense out of it. I don't think of it as providing analogies for the Trinity. Rather it is to help understand certain affirmations about God, for example, that God is tri-personal and yet he's one entity, and I do think we can make progress on understanding that. Kevin Harris: And you would say that there are no perfect or dead on accurate analogies or even illustrations that completely capture it. They all fall short? Dr. Craig: Right, even, as I say, the Cerberus analogy, as helpful as it is, ultimately falls short in that regard. But it helps us to make progress toward understanding certain affirmations of the Trinity. Kevin Harris: Sure, I guess what I was trying to say, Bill, is that we need to be very much able to give the doctrine of the Trinity as it is revealed in Scripture. And then I hear you say that we can go on and try to show the rationale and that it's not contradictory and so on, in defining and describing the Trinity itself. Dr. Craig: Yes, we try to make sense of it. The unitarian or the detractor of the doctrine of the Trinity alleges that this is either a logical contradiction or it's just an incomprehensible doctrine, one that makes no sense at all. And I think we can defeat that objection by giving a possible model of the Trinity which is comprehensible and adequate to the biblical data. And this model of thinking of God as a soul endowed with three sets of rational faculties each sufficient for personhood is such a model. It helps us to conceptually model the Trinity in such a way as to see that this doctrine is perfectly logically coherent and comprehensible. Kevin Harris: Is the Trinity, however, a mystery? Dr. Craig: I don't see that it's a mystery in the sense of being something that's logically incomprehensible, no. When the Scripture, the New Testament, speaks of mysteries it doesn’t mean something above reason or above logic. That's very clear when you read how the word is used in the New Testament. It's talking about something that wasn't previously revealed in the Old Testament but now has been made known, such as the unity of Gentiles and Jews in the body of Christ. Paul says, this is a mystery which is now made known by God. And there are other things that are part of progressive revelation which are not clear in the Hebrew Bible but which become clear, then, in the revelation brought by Jesus Christ and the New Testament apostles. So when the New Testament uses the word “mystery” it's not using it in the sense of truths that are above reason or logically incomprehensible. They're just truths which have been previously unrevealed. Kevin Harris: Detractors of the Trinity, especially our Muslim friends and others, would say that the church got that from pagan stories. How would you respond? Dr. Craig: Well, I would say that's silly. There's no evidence whatsoever of that. In fact it would be preposterous to think that Jewish monotheists would come to adapt the doctrine of God to fit these sort of mythological stories. Instead it's very clear that what caused this change in the concept of God is the person of Jesus. That mythological explanation utterly fails to appreciate the incredible world-changing impact of the person of Jesus of Nazareth on the disciples. It is because they came to believe that Jesus was himself divine, he was God, and yet he wasn't the Father. They were forced to come to an understanding of God which involved multiple persons in the Godhead. 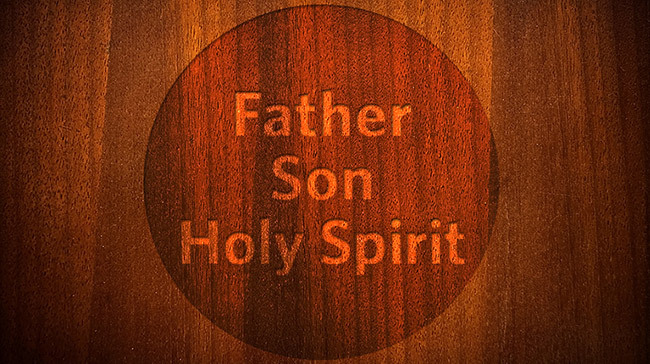 And not just Jesus but then also the Spirit of Christ which took over his role when he left this universe. So the doctrine of the Trinity is clearly rooted in the impact of the person of Jesus of Nazareth upon these early Jewish disciples. Kevin Harris: Oh, yeah, how radical. We don't find a Trinity in pagan mythology, we just don't. We find triads. Dr. Craig: That's the case, as well. Kevin Harris: The Trinity is so unique. Dr. Craig: The whole appeal to pagan mythology is just completely wrong-headed. I think New Testament scholarship has come to appreciate that Christianity as a movement is rooted in the person of Jesus of Nazareth. And it was Jewish through and through from the start. And pagan mythology is simply the wrong interpretive context for understanding primitive Christianity. Kevin Harris: I also want to mention that twice now Dr. White has made intimations that on our podcast we put philosophy over the Word of God. He says the reverse is true – that we need to know the Word of God and then develop our apologetics and philosophy based on the Word of God. Is there any merit to that criticism? Dr. Craig: No, because that's my own view, the view that you just described. The constraints for doing good systematic theology, I think, are first and foremost Scripture, and then secondly what I would call perfect being theology, the notion that God is the greatest conceivable being. So that when we interpret Scripture we will interpret it in such a way as to magnify and glorify God to the greatest extent. So if Scripture says, “God is all-mighty,” for example, it doesn’t explain to us what that means, but the systematic theologian who's committed to perfect being theology will understand “all-mighty” in terms of maximal power. He will construe omnipotence in the greatest terms that are logically coherent. Similarly with other attributes of God. So I see the constraints on doing theology as being first and foremost Scripture, and then you will interpret Scripture in light of perfect being theology. Kevin Harris: Philosophy helps us to fill in some gaps, though, that perhaps Scripture doesn't specifically address? Dr. Craig: Well, exactly. For example, God's eternity. Scripture affirms that God is eternal. But Scripture is under-determinative with respect to how you understand eternity. Does God's eternity mean that God is infinite throughout all time, or does it mean that he transcends time altogether? Well that is not an issue to be settled scripturally. Scripture doesn't speak to that question. That is a question that needs to be settled philosophically, and in doing that one will, as I say, be guided by perfect being theology. One will construe God's attributes in such a way as to glorify and magnify God as the greatest conceivable being. Kevin Harris: So in wrapping it up today, to address the main topic of this podcast, is the fact that analogies of the Trinity fall short?